Last week, NFL Blitz was made available for free to Playstation Plus members, and now it turns out that we'll be getting another free game this week as well - King of Fighters XIII. Add-ons for the game will also be 30% off the PSN sale price (which is 50% off of the normal price. 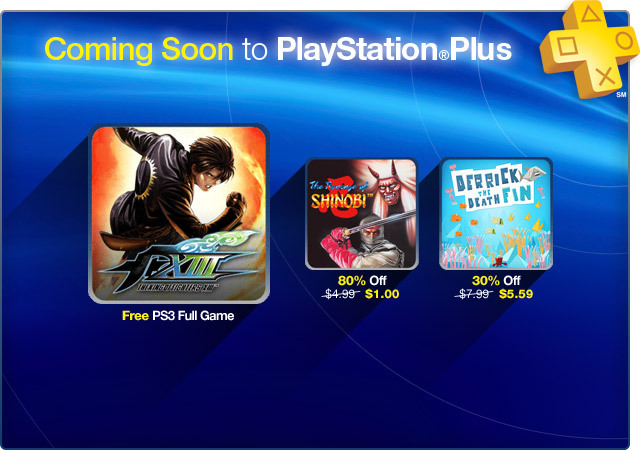 Additionally, two other games will also be joining KOFIII in the Playstation Plus deal this week: The Revenge of Shinobi (which is on sale for $1) and Derrick the Deathfin (on sale for $5.59) which was announced as a PSN exclusive a couple of weeks back. King of the Fighters XIII was initially released last Fall and to mostly positive reviews, so this marks one of the bigger free releases to Playstation Plus since Borderlands came to the service last month. Will you be downloading King of the Fighters XIII or the other deals this week?